Bougainvillea spectabilis, also known as great bougainvillea, is a species of flowering plant. It is native to Brazil, Bolivia, Peru, and Argentina's Chubut Province. Bougainvillea spectabilis grows as a woody vine or shrub, reaching 15 to 40 feet (4.6 to 12.2 m) with heart-shaped leaves and thorny, pubescent stems. The flowers are generally small, white, and inconspicuous, highlighted by several brightly colored modified leaves called bracts. The bracts can vary in color, ranging from white, red, mauve, purple-red, or orange. Its fruit is a small, inconspicuous, dry, elongated achene. Bougainvillea spectabilis is native to Brazil, Peru, Bolivia, and Chubut Province, Argentina, but it has been introduced in many other areas. 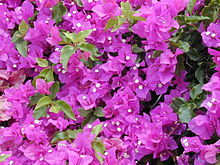 Bougainvillea spectabilis can grow in hardiness zones 10-11, preferring full sun , dry conditions, and fertile soil. It can be propagated from stem and root cuttings. Bougainvillea spectabilis has been reported to have anti-inflammatory, anti-bacterial, anti-viral, anti-tumor, anti-hypercholestrolemic, anti-hyperlipidemic, and anti-fertility properties. The Yanadi tribe of Chittoor district, Andhra Pradesh, India, once used the leaves of Bougainvillea spectabilis to heal diabetes. The plant is also widely grown as an ornamental plant. ^ a b "Bougainvillea spectabilis". Natural Resources Conservation Service PLANTS Database. USDA. Retrieved September 8, 2013. ^ "Bougainvillea spectabilis". Germplasm Resources Information Network (GRIN). Agricultural Research Service (ARS), United States Department of Agriculture (USDA). Retrieved 20 December 2014. ^ a b c d e T. K. Lim (1 January 2014). Edible Medicinal and Non Medicinal Plants, Volume 8: Flowers. Springer Science & Business. pp. 489–494. ISBN 978-94-017-8748-2. ^ "Tropicos". tropicos.org. Retrieved 20 December 2014. ^ a b c d Amanda Jarrett (2003). Ornamental Tropical Shrubs. Pineapple Press Inc. p. 27. ISBN 978-1-56164-275-5. Wikimedia Commons has media related to Bougainvillea spectabilis.